This single big cask was filled with a selection of the best amontillados of the house (same genealogy as our previous releases No.37, 58, etc. ), refreshed with a moderate proportion of the extraordinary manzanilla pasada from Misericordia. 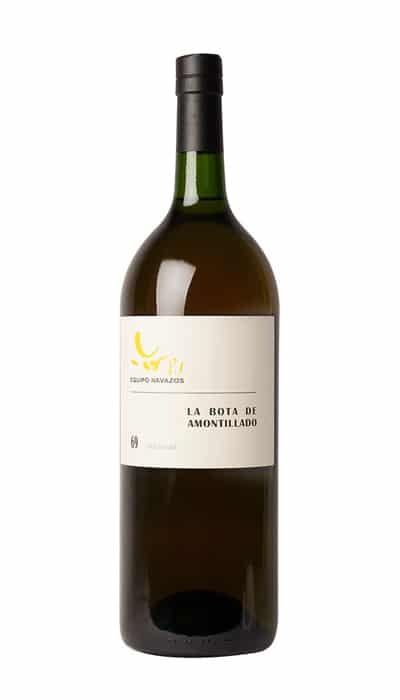 The resulting wine has aged a few more years in such unique place until the contents of the tonel has been bottled for this release La Bota de Amontillado 69 “Mágnum”. A natural amontillado whose average estimated age is around 17-18 years old. The historic premises of Calle Misericordia in Sanlúcar de Barrameda were thoroughly refurbished just a few years ago. The works did not significantly affect the thousands of casks of the solera and criaderas of manzanilla that are maturing in the two main buildings, but it did change the disposition and the wines of the Sala de Banderas, mainly casks of amontillado in the most delicate Sanlúcar style. Besides the dozens of butts that surround the space in this cozy bodega, there are a few vessels that are especial because of their size and their origins, particularly a magnificent tonel gordo (120 arrobas, i.e. 2000 liters), singularly placed in a corner of the room, separated from the main rows of casks that are standing by the wall. It is best enjoyed in a sufficiently large white wine glass towards 13/14ºC—so it should be served slightly below that to allow for aeration. An excellent aperitif on its own, it also works beautifully with some dishes, such as seafood with an intense iodised taste (oysters, red shrimps, barnacles, anemones…) or spicy asian food.